The Leap Into Freedom has inspired countless civil rights movements through its bold statement about freedom. However, we look into the sinister circumstances that surrounded the moment after it was taken. Ask any German about some of the events that have come to define German history and you’ll quickly get settled into a discussion about the Berlin Wall. While academics could go on about the economic and political implications of the 28 year divide, that's a less engaging story compared to the narratives of divided families and communities. In that vein, we can look at the one person who perhaps felt this most acutely - Conrad Schumann. Back in the 50s, the young Conrad was a border guard with the East German Bereitschaftspolizei (Riot Police). It wasn't long before he quickly rose to become an NCO after demonstrating remarkable responsibility and unwavering allegiance to the nascent German Democratic Republic. It was for these qualities that Schumann would eventually find himself deployed along the Berlin Wall which was then just a line of barbed wire. On that fateful day on 15 August 1961, Schumann found himself in quandary. On the one hand, the socialist promises of Communism appealed to his idealism. However, his deployment along the barbed wire fence repudiated the Communist indoctrination he had received at training. Was the East German government lying about West Berlin police shooting at civilians 'escaping' to the East? He found that it was instead the East that was restricting people's movements. Schumann’s post at Bernauerstrasse thus became the staging ground for a mounting degree of disillusionment with the East's communist government. These visible signs of anxiety (that came to a head on 15 Aug) caught the attention of West Berlin police, and a crowd soon gathered on the Western side of the border. As if the scene was being filmed for a movie, shouts of ‘Komm rüber!’ or ‘Come over!’ filled the 'set'. Unbeknownst to many, history was about to be made and thankfully, Leibing (a photographer that was tipped off about Schumann’s possible defection) was already on hand to immortalise this defection for the history books. While Leibing says that he only got one negative from the entire affair, it's hard to see that any other would have been more iconic - he managed to capture the act at the most defining point of the leap into freedom. How did he acquire this skill of expert timing? He purportedly honed his skills by photographing race horses. Schumann’s freedom however, did not come without a price. For starters, he describes the lengthy interrogation sessions he was subject to as being ’squeezed like a lemon’. Indeed, its seems as if the East Berliners were just as paranoid about the West as West Berliners were hungry for information on the East. For the next few years, Schumann (a very private man), found himself being hounded by the press and was constantly in between jobs. He led an alcohol defined existence which was further worsened by bouts of depression. Being estranged from his family didn't help either. In the intervening years before the fall of the Berlin Wall, Schumann was continually wracked by the guilt of abandoning his comrades. For those acquainted with the oppressive tendencies of the GDR, Schumann also knew that future of his family that remained in the East was quite bleak. For these reasons (and presumably others too), Schumann kept himself (and his psyche) under the radar, working tirelessly (27 years) in a nondescript assembly line owned by the car manufacturer Audi. Fate would not treat Schumann kindly. Even after the fall of the GDR, a trip back to his native Saxony was met by people who shunned Schumann as an outsider because of his startling defection. An out of the blue yet fateful argument with his wife caused him to take his life; no last words were recorded. What does the story of Schumann say about how we treat our historical figures? Despite escaping from an oppressive regime, Schumann found himself being tormented by another form of ‘oppression’ - the indiscriminate scrutiny of the 'free press' and the guilt of leaving loved ones behind. This phenomena was not unique to Schumann either as this seemingly dissonant manifestation of oppression is a common thread throughout the narratives of many Soviet defectors. Indeed, those who escaped Communist regimes often had to contend with the struggle of reconciling personal aspirations for freedom with the thought of leaving loved ones behind in despotism. At the time of the leap into freedom, both Leibing and Schumann were 19, smack in the middle of the demographic that would be mostly affected by the division. German youth regardless of which side of the border they lived in were robbed of a having shared heritage, and found themselves pursuing vastly divergent futures. To this day, the effect of this division permeates throughout all facets of unified Germany, be it in politics, economics or sociocultural issues. We should thus be careful about harnessing managing the power of photography - though Schumann’s act of defiance acted as a beacon of freedom for onlookers and future defectors, it also completely ruined the life of someone who simply wanted something better for himself and others. After all, Schumann once remarked that a strong motivator for his defection was that he never wanted to shoot anyone seeking freedom. By doing so however, he escaped certain hardship only to be trapped in a state of existential uncertainty. 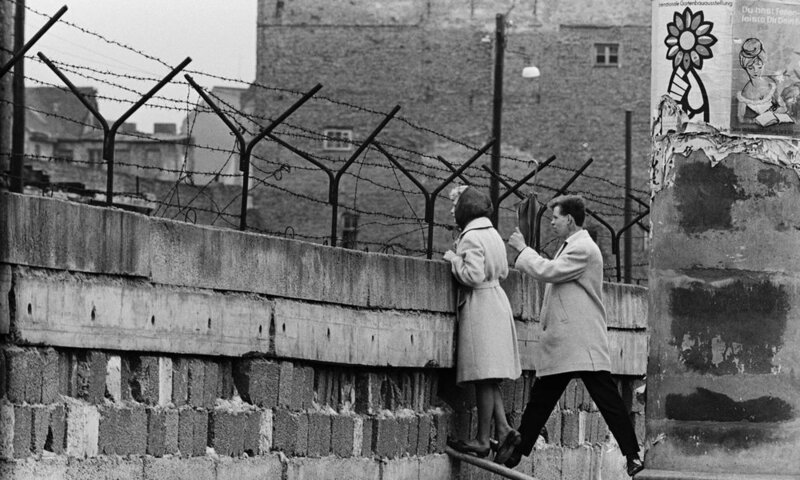 The Berlin Wall ripped apart families and communities as one of the biggest atrocities that could befall one of Europe’s freest cities - we should all listen to and heed the story of Conrad Schumann. Love what you're reading? Follow us on Facebook to keep up with all of our articles on travel and photography!